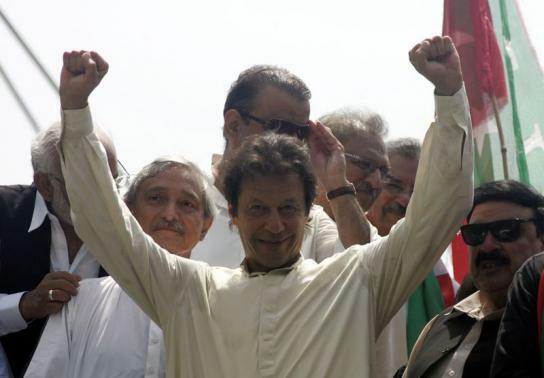 (Reuters) - Pakistani opposition politician Imran Khan, who is leading one of two large anti-government demonstrations in the capital, has called on followers to show their strength on Sunday as he tries to force the government to resign. Khan, a former international cricket star whose speech is still peppered with metaphors of the game, told supporters in a late-night Saturday speech, "maybe the world cup final will be played tomorrow ... people will forget Tahrir Square". The reference to the square, site of Egypt's most violent anti-government protests, followed a warning by Khan earlier on Saturday that his supporters wanted to march on Parliament house and he was struggling to hold them back. Khan and cleric Tahir ul-Qadri both led tens of thousands of supporters to downtown Islamabad on Friday. Both protest leaders say they will stay in the streets until Prime Minister Nawaz Sharif, whom they condemn as corrupt, is forced to resign. The protests have raised worries about Pakistan's stability barely a year after Sharif took power in a landslide election win that marked the first democratic transfer of power in the history of the nuclear-armed nation of 180 million people. Sharif has been struggling to overcome daily power cuts, a sluggish economy and a Taliban insurgency. Anti-Western militant groups have been growing in strength, worrying Pakistan's allies. Sharif's relationship with the country's historically powerful military have been poor since he took office, leading some in his government to speculate elements in the military are directing the protests as a way of weakening the government and discouraging it from policies the military disapproves of. Those include the prosecution for treason of former army chief and president Pervez Musharraf, who once overthrew Sharif in a coup in 1999, ushering in a decade of military rule. Despite Pakistan's history of coups, few feel the military wants to oust Sharif. The country's highly activist Supreme Court issued a warning on Friday against any "unconstitutional" action. Some analysts say far from the military directing the protesters, the demonstrations happened because Sharif's opposition sense that he was vulnerable after months of rocky relations with the military, dithering over peace talks with the Taliban and his failure to fill key ministries more than a year after he took office. Qadri and Khan arrived in Islamabad late on Friday night after a two-day procession through the province of Punjab, the heartland of support for Sharif. Khan's protest camp on Sunday morning was nearly deserted apart from some policemen. He had urged his followers to leave the site and get some rest and come back mid-afternoon Sunday. Qadri's supporters have set up camp on the capital's main thoroughfare, Jinnah Avenue, forcing many businesses to shutter. On Sunday morning, Qadri's supporters were making breakfast, washing and sleeping stretched out on mats they had brought along with them. Some studied newspaper reports of his Saturday speech, in which he promised a new government that would crack down on corruption, and provide free houses and subsidised food and power for the poor. "We are giving 48 hours for the government to resign and dissolve the assemblies and present themselves before the law," said Qadri. "Otherwise the people will decide and I will not be responsible."